I saw some incredible collages by Romare Bearden ( whom I have previously mentioned). He is one of my favorite African American artists. He had influenced my work as an artist. Where did I see his work? A museum? An art gallery? In a book? Nope. In a department store. Macys to be specific. Macys???? Yes.! 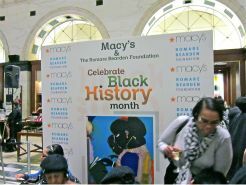 A few nights ago the Center City Philadelphia Macys hosted a special opening to celebrate Black History month and what would have been Romare Bearden's 100th birthday ( his date of birth was September 2, 1911 so this year he would have been 101. Two of his collages are on view at the Center City Philadelphia Macys until Monday, February 19th and then the art travels to Washington D.C. It has already been exhibited at the New York City Macys. Macys is also having a sweepstakes to win a trip for two to Paris. I applaud the fact that Macys has partnered with the Romare Bearden Foundation to exhibit Mr. Bearden's work. Art and commerce are the perfect marriage. The exhibit also features collage art by other artists who were heavily influenced by Mr. Bearden. Artworks by Juan Sanchez, Arian Huang, Michael Harris, & Tomie Arai were included in the exhibit. For more information about the schedule of where you can see Mr. Bearden's work at other Macy's locations, please visit the Macys website www.Macys.com or the Romare Bearden foundation at www.beardenfoundation.org I have included their website on my blogroll too! And although I mentioned this in a previous blog entry , I will mention it again. Mr. Bearden created mind blowing watercolor paintings for the opening credits of the John Cassavete's 1980 film GLORIA . The watercolor paintings by Mr. Bearden worth renting or buying the film ( although I love the film too- Gena Rowlands deserved an Oscar for her performance in my opinion.